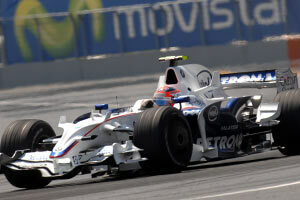 The BMW Sauber F1.08 celebrated its global public presentation in Munich on 14th January 2008. "The data which the F1.08 has delivered ahead of its roll-out is extremely promising," says Rampf. "And the development work will continue full speed ahead up to the start of the new season. We have already come up with another aero package for the season-opener in Melbourne on 16 March, and this will also change the external appearance of the F1.08 once more." After the impressive launch that stunned experts by the giant leap BMW had made, Technical Director Willy Rampf explained the philosophy behind the race car for the 2008 season boils down to what he calls "evolutionary new development". In other words, last year’s car already provided the engineers with a sound basis for the BMW Sauber F1.08, and they did not have to spend time correcting faults. Instead they were able to use knowledge gained over the course of the 2007 season and channel their energies into the development of innovations which build on this basis. The engineers’ development work focused on achieving a high level of aerodynamic efficiency coupled with a stable aero balance: the lower the loss of downforce through corners, the faster the car can travel and the greater the confidence it gives the driver. Other development aims included improving mechanical grip in order to make the best possible use of the standard tyres and reducing the weight of various components to allow maximum use of ballast in optimising weight distribution. A particularly eye-catching feature of the F1.08 is the mighty front wing. Having said that, the car’s nose has actually slimmed down – in equal measure to the rear end. The narrower engine cover has been designed with all-new extra wing elements. Another new and immediately noticeable feature are the hub caps, or "rim shields". Two changes to the regulations have had a major effect on the construction of the cars for the 2008 season: the introduction of standardised electronics (SECU) and the new running time stipulation for the gearboxes (developed in Munich), which must now endure over four grands prix. Since the SECU does not allow for traction control, among other functions, mechanical grip and sensitive accelerator control will gain in importance. Despite being slower than McLaren and Ferrari, the new F1.08 was much closer to the leaders than the team had ever been. Robert Kubica consequently secured the team's first pole position at Bahrain while the Canadian Grand Prix marked the first win, a one-two finish led, again, by Kubica.